(Nanowerk News) Some 350 years ago, Prof. Robert Hooke was the first to identify individual plant cells through his microscope. Ever since, microscopes have been indispensable tools for the life sciences; today, the most advanced are powerful enough to show pattern in individual molecules. On this level, Fraunhofer FIT offers complete turnkey systems for biomolecular analysis, diagnosis and screening in medical and pharmaceutical research. At HANNOVER MESSE the researchers present the latest generation of their devices and imaging analysis software. Proteins, the cellular building blocks, can be visualized and analyzed in great detail today. Here, Fraunhofer FIT presents a fully automated high-performance microscope. One of its diagnostic applications will be to study the complex interactions of proteins between cells. In tumor diagnostics our microscope allows to classify slightly different types of tumors more precisely and to fine-tune therapy accordingly. Key factors for the superior performance of our system are high-precision hardware and image analysis software that is trainable and can be customized to the user's specific application. IMIKRID, a microfluidic diagnostic system. The system produces a laser scan of a tissue probe's surface with a resolution of a few nanometers. In addition, the laser beam can trigger fluorescence effects that give more detailed insights into the morphology and structure of the probe. "The reflected light is used to compose high-resolution images of the probe; our learning, trainable image analysis software can extract more valuable information from these images than the tools widely used today," notes Dr. Harald Mathis, head of the department for Biomolecular Optical Systems at Fraunhofer FIT. IMIKRID, the microfluidic diagnostic system, improves early diagnosis of cancer and cardiac diseases to make therapy more effective. IMIKRID is being developed by a group of Fraunhofer institutes led by Fraunhofer FIT. The system implements a novel detection method that can detect markers even at a single-molecule level of concentration. 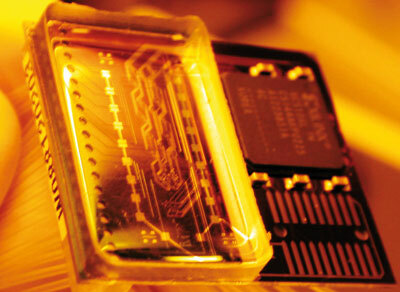 At its core is a microfluidic chip with four independent single-molecule biosensors. Main application fields of IMIKRID are in cardiological preventive diagnostics to detect and monitor cardiac diseases, and in oncological diagnostics at very early, pre-symptom stages. A third field is lactate monitoring through sudor analysis, both in infarct prevention and in athletes' fitness monitoring. IMIKRID and the automated protein-level microscope system will be presented at HANNOVER MESSE, Forum tech transfer - Gateway2Innovation in Hall 2, booth D12/E09, from April 19 to 23, 2010.